10 A None No Power Seat 10 A is a standard Prestige Class angle lie flat seat. 10 B None No Power Seat 10 B is a standard Prestige Class angle lie flat seat. 10 D None No Power Seat 10 D is a standard Prestige Class angle lie flat seat. 10 E None No Power Seat 10 E is a standard Prestige Class angle lie flat seat. 10 F None No Power Seat 10 F is a standard Prestige Class angle lie flat seat. 10 H None No Power Seat 10 H is a standard Prestige Class angle lie flat seat. 10 J None No Power Seat 10 J is a standard Prestige Class angle lie flat seat. 28 A None No Power Seat 28 A is a bulkhead Economy Class seat with restricted legroom. Passengers with infants are often seated in this area as it is equipped with a bassinet. There is no floor storage during takeoff and landing. 28 B None No Power Seat 28 B is a bulkhead Economy Class seat with restricted legroom. Passengers with infants are often seated in this area as it is equipped with a bassinet. There is no floor storage during takeoff and landing. 28 C None No Power Seat 28 C is a bulkhead Economy Class seat with restricted legroom. Passengers with infants are often seated in this area as it is equipped with a bassinet. There is no floor storage during takeoff and landing. 28 D None No Power Seat 28 D is a standard Economy Class bulkhead seat. There is no floor storage during takeoff and landing. The tray table is in the armrest, making the armrest immovable and slightly reducing seat width. 28 E None No Power Seat 28 E is a standard Economy Class bulkhead seat. There is no floor storage during takeoff and landing. The tray table is in the armrest, making the armrest immovable and slightly reducing seat width. 28 F None No Power Seat 28 F is a standard Economy Class bulkhead seat. There is no floor storage during takeoff and landing. The tray table is in the armrest, making the armrest immovable and slightly reducing seat width. 28 G None No Power Seat 28 G is a bulkhead Economy Class seat with restricted legroom. Passengers with infants are often seated in this area as it is equipped with a bassinet. There is no floor storage during takeoff and landing. 28 H None No Power Seat 28 H is a bulkhead Economy Class seat with restricted legroom. Passengers with infants are often seated in this area as it is equipped with a bassinet. There is no floor storage during takeoff and landing. 28 J None No Power Seat 28 J is a bulkhead Economy Class seat with restricted legroom. Passengers with infants are often seated in this area as it is equipped with a bassinet. There is no floor storage during takeoff and landing. 35 A None No Power Seat 35 A is a standard Economy Class seat, however this row has a misaligned window. 35 J None No Power Seat 35 J is a standard Economy Class seat, however this row has a misaligned window. 40 C None No Power Seat 40 C juts into the aisle and is often bumped by service carts and other passengers during flight. 40 G None No Power Seat 40 G juts into the aisle and is often bumped by service carts and other passengers during flight. Proximity to the lavatory may be bothersome. 40 H None No Power Seat 40 H may not recline due to the wall behind. Proximity to the lavatory may be bothersome. 40 J None No Power Seat 40 J may not recline due to the wall behind. Proximity to the lavatory may be bothersome. 41 A None No Power Seat 41 A may not recline due to the wall behind. Proximity to the lavatory may be bothersome. 41 B None No Power Seat 41 B may not recline due to the wall behind. Proximity to the lavatory may be bothersome. 41 D None No Power Seat 41 D does not recline due to the wall behind. Proximity to the lavatories may be bothersome. 41 E None No Power Seat 41 E does not recline due to the wall behind. Proximity to the lavatories may be bothersome. 41 F None No Power Seat 41 F juts into the aisle and is often bumped by service carts and other passengers during flight. Proximity to the lavatories may be bothersome. This seat may not recline. 42 A None No Power Seat 42 A has extra legroom, but some of the space is impeded by the slide that protrudes from the exit door. Proximity to the lavatories and galley can be bothersome as passengers tend to congregate in this area. The tray table is in the armrest, making the armrest immovable and slightly reducing seat width. There is no floor storage for this seat during takeoff and landing. It can get cold by the exits during flight. 42 B None No Power Seat 42 B has extra legroom due to the emergency exit. Proximity to the lavatory and galley may be bothersome as passengers tend to congregate in this area. The tray table is in the armrest, making the armrest immovable and slightly reducing seat width. There is no floor storage during takeoff and landing. 42 C None No Power Seat 42 C has extra legroom due to the emergency exit. Proximity to the lavatory and galley may be bothersome as passengers tend to congregate in this area. The tray table is in the armrest, making the armrest immovable and slightly reducing seat width. There is no floor storage during takeoff and landing. 42 G None No Power Seat 42 G has extra legroom due to the emergency exit. Proximity to the lavatory and galley may be bothersome as passengers tend to congregate in this area. The tray table is in the armrest, making the armrest immovable and slightly reducing seat width. There is no floor storage during takeoff and landing. 42 H None No Power Seat 42 H has extra legroom due to the emergency exit. Proximity to the lavatory and galley may be bothersome as passengers tend to congregate in this area. The tray table is in the armrest, making the armrest immovable and slightly reducing seat width. There is no floor storage during takeoff and landing. 42 J None No Power Seat 42 J has extra legroom, but some of the space is impeded by the slide that protrudes from the exit door. Proximity to the lavatories and galley can be bothersome as passengers tend to congregate in this area. The tray table is in the armrest, making the armrest immovable and slightly reducing seat width. There is no floor storage for this seat during takeoff and landing. 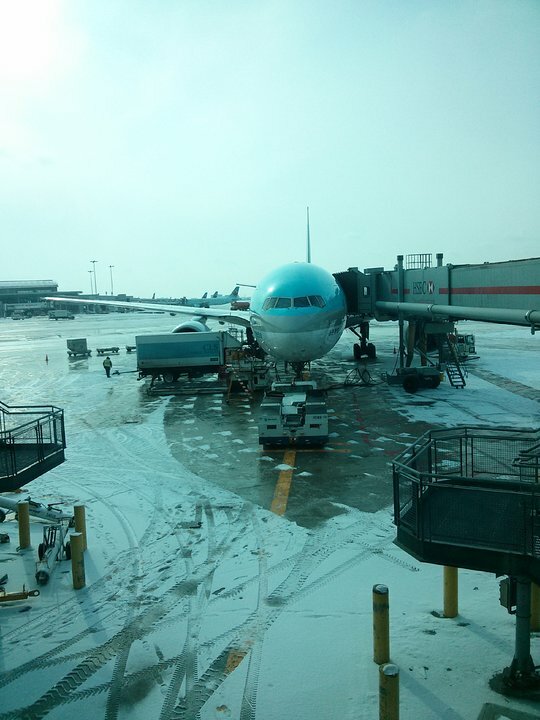 It can get cold by the exits during flight. 43 D None No Power Seat 43 D has slightly restricted due to the emergency exit. Proximity to the galley may be bothersome.The tray table is in the armrest, making the armrest immovable and slightly reducing seat width. There is no floor storage during takeoff and landing. This is a bassinet position, so passengers with infants are often seated here. 43 E None No Power Seat 43 E has slightly restricted due to the emergency exit. Proximity to the galley may be bothersome.The tray table is in the armrest, making the armrest immovable and slightly reducing seat width. There is no floor storage during takeoff and landing. This is a bassinet position, so passengers with infants are often seated here. 43 F None No Power Seat 43 F has slightly restricted due to the emergency exit. Proximity to the galley may be bothersome.The tray table is in the armrest, making the armrest immovable and slightly reducing seat width. There is no floor storage during takeoff and landing. This is a bassinet position, so passengers with infants are often seated here. 52 C None No Power Seat 52 C juts into the aisle and is often bumped by service carts and other passengers during flight. 52 G None No Power Seat 52 G juts into the aisle and is often bumped by service carts and other passengers during flight. 53 A None No Power Seat 53 A is in the last row of the aircraft and may not recline. Proximity to the lavatory and galley may be bothersome. 53 B None No Power Seat 53 B is in the last row of the aircraft and may not recline. Proximity to the lavatory and galley may be bothersome. 53 D None No Power Seat 53 D is in the last row of the aircraft and may not recline. Proximity to the lavatory and galley may be bothersome. 53 E None No Power Seat 53 E is in the last row of the aircraft and may not recline. Proximity to the lavatory and galley may be bothersome. 53 F None No Power Seat 53 F is in the last row of the aircraft and may not recline. Proximity to the lavatory and galley may be bothersome. 53 H None No Power Seat 53 H is in the last row of the aircraft and may not recline. Proximity to the lavatory and galley may be bothersome. 53 J None No Power Seat 53 J is in the last row of the aircraft and may not recline. Proximity to the lavatory and galley may be bothersome. 7 A None No Power Seat 7 A is a standard Prestige Class angle lie flat seat. 7 B None No Power Seat 7 B is a standard Prestige Class angle lie flat seat. 7 D None No Power Seat 7 D is a standard Prestige Class angle lie flat seat. 7 E None No Power Seat 7 E is a standard Prestige Class angle lie flat seat. 7 F None No Power Seat 7 F is a standard Prestige Class angle lie flat seat. 7 H None No Power Seat 7 H is a standard Prestige Class angle lie flat seat. 7 J None No Power Seat 7 J is a standard Prestige Class angle lie flat seat. 8 A None No Power Seat 8 A is a standard Prestige Class angle lie flat seat, although proximity to the lavatory and galley may be bothersome. 8 B None No Power Seat 8 B is a standard Prestige Class angle lie flat seat, although proximity to the lavatory and galley may be bothersome. 8 D None No Power Seat 8 D is a standard Prestige Class angle lie flat seat, although proximity to the lavatory and galley may be bothersome. 8 E None No Power Seat 8 E is a standard Prestige Class angle lie flat seat, although proximity to the lavatory and galley may be bothersome. 8 F None No Power Seat 8 F is a standard Prestige Class angle lie flat seat, although proximity to the lavatory and galley may be bothersome. 8 H None No Power Seat 8 H is a standard Prestige Class angle lie flat seat, although proximity to the lavatory and galley may be bothersome. 8 J None No Power Seat 8 J is a standard Prestige Class angle lie flat seat, although proximity to the lavatory and galley may be bothersome. 9 A None No Power Seat 9 A is a bulkhead Prestige Class angle lie flat seat. Passengers with infants are often seated in this area as it is equipped with a bassinet. Proximity to the lavatory and galley may be bothersome. There is no floor storage during takeoff and landing. 9 B None No Power Seat 9 B is a bulkhead Prestige Class angle lie flat seat. Passengers with infants are often seated in this area as it is equipped with a bassinet. Proximity to the lavatory and galley may be bothersome. There is no floor storage during takeoff and landing. 9 D None No Power Seat 9 D is a bulkhead Prestige Class angle lie flat seat. Passengers with infants are often seated in this area as it is equipped with a bassinet. Proximity to the lavatory and galley may be bothersome. There is no floor storage during takeoff and landing. 9 E None No Power Seat 9 E is a bulkhead Prestige Class angle lie flat seat. Passengers with infants are often seated in this area as it is equipped with a bassinet. Proximity to the lavatory and galley may be bothersome. There is no floor storage during takeoff and landing. 9 F None No Power Seat 9 F is a bulkhead Prestige Class angle lie flat seat. Passengers with infants are often seated in this area as it is equipped with a bassinet. Proximity to the lavatory and galley may be bothersome. There is no floor storage during takeoff and landing. 9 H None No Power Seat 9 H is a bulkhead Prestige Class angle lie flat seat. Passengers with infants are often seated in this area as it is equipped with a bassinet. Proximity to the lavatory and galley may be bothersome. There is no floor storage during takeoff and landing. 9 J None No Power Seat 9 J is a bulkhead Prestige Class angle lie flat seat. Passengers with infants are often seated in this area as it is equipped with a bassinet. Proximity to the lavatory and galley may be bothersome. There is no floor storage during takeoff and landing. 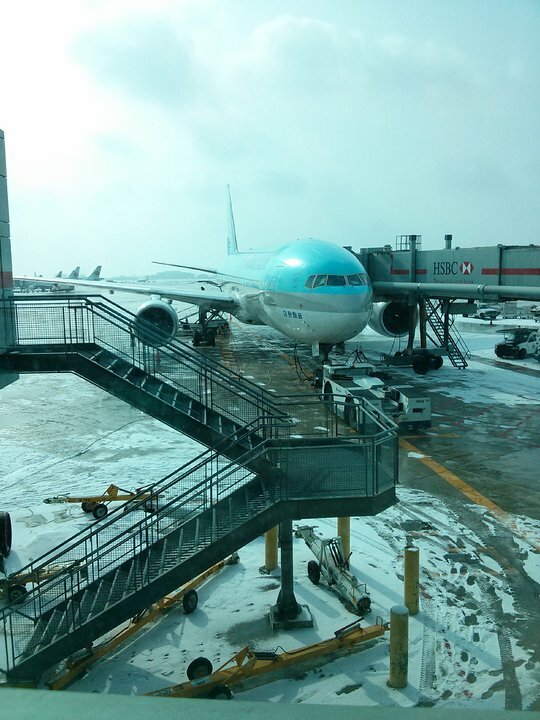 Korean Air operates two versions of the B777-200ER aircraft. This version is equipped with 261 seats and offers three classes of service: First, Prestige, and Economy. Seats in First Class are Kosmo Sleeper open suites and seats in Presige Class are Prestige Plus angle lie flat seats. All seats in this aircraft are fitted with AVOD entertainment and in-seat power ports. The following rows may be used as reference: First Class are rows 1-2; Prestige Class are rows 7-10; and Economy ends at row 53. 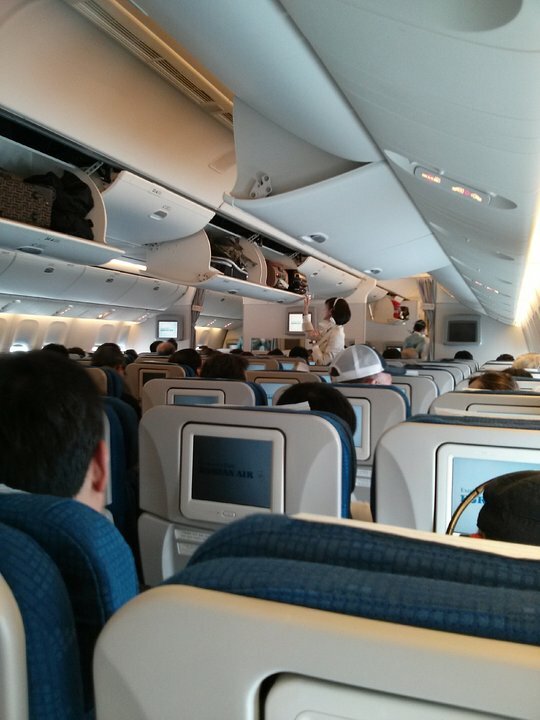 Short hop in First Class, ICN-HKG 25 Sep 2015. Wife and I were the only passengers. This seat is great for the solo traveller: loads of space and excellent service. For a couple, the privacy screen, even fully down, was a real drawback. For converstaion, the visitor's stool at the foot of each seat was a boon.